The online P.C. 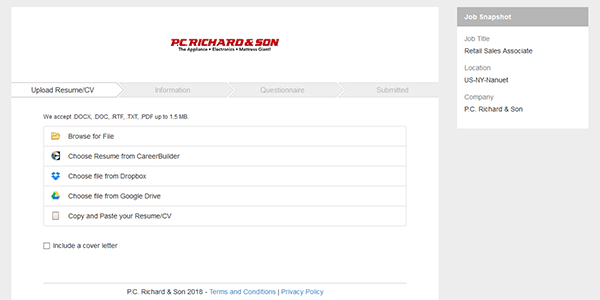 Richard & Son job application is available via the company’s careers page (scroll down to learn how to use the careers page/site). Follow the links posted on this page (near the top of the page/in the instructional guide) to go to the company’s employment page. 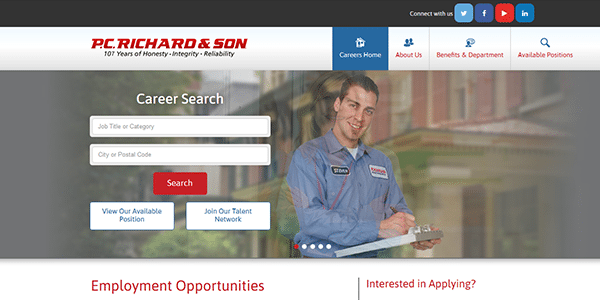 When you open the company’s employment portal you will be able to search for current job openings, register for an online account, and fill out/submit applications for any job openings that you want to apply for. About the Company: P.C. 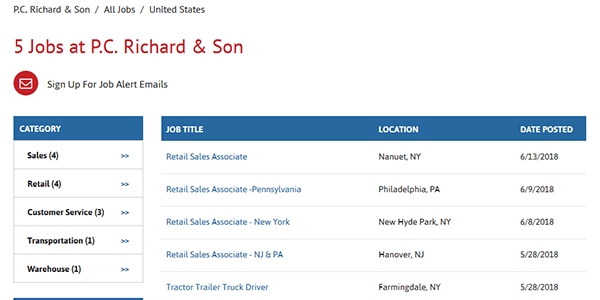 Richard & Son is an American chain of appliance/electronic stores based out of New York. The company employs more than 2,900 people throughout its numerous locations (including its corporate offices). Step 1 – Click on the link posted below to go to the company’s main careers page. Step 2 – On the careers page, enter a job title/category into the first field and then enter a city/postal code into the second field. Click the “search” button to load the list of results/job openings. Step 3 – Click the link/title of the position you’re interested in applying for. The options on the left side of the page can be used to filter through the results if required. Step 4 – Review the job description section(s) and then click the “Apply” button in the right corner of the page to go to the next step of the process.